Do You Have a Full Team of Bowlers? You may choose a one-time lesson or return the following week to build on your previous lesson(s). 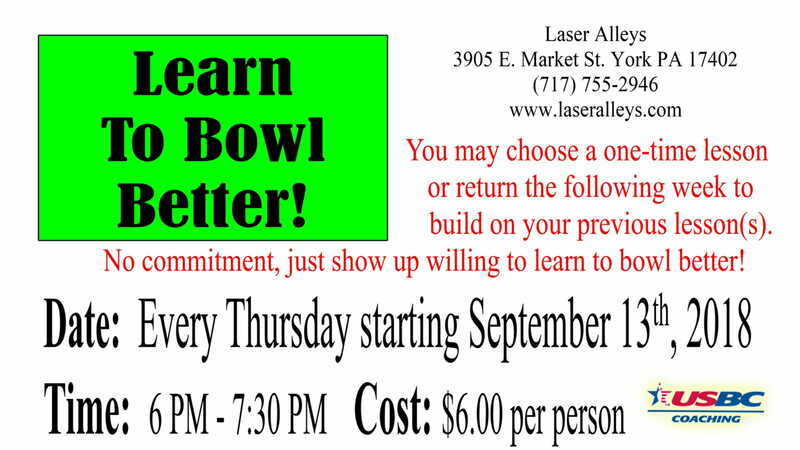 NO Commitment - just show up wanting to learn to bowl better!! Bowl 2 Games and get the 3rd game FREE! 9 pin down counts as a "Strike"
Prizes included: Gift Cards to Local Restaurants, Lottery Tickets - Your chance to win millions! Bowlers Bucks: Redeem Towards bowling, snack bar items or merchandise at Bowlers Supply! $16.00 per person per week!! Weekly Jackpots, Survivor, Mystery Game, Progressives and More!! 3 FREE games of practice bowling each week for you and your teammates!! Brunswick T-Zone Bowling Ball in your choice of weights and colors and it even includes drilling. (Value $75.95) OR a $75 Gift Certificate for Bowlers Supply towards another Bowling Ball of your choice!! Every Night of Bowling your Team will get 2 bottles of Wine or 2 pitchers of Domestic Draft Beer and UNLIMITED PIZZA from 6:30pm – 7:30pm!! 3 FREE games of practice bowling each week for you and your team mates!! HUGE Party the last night of bowling!! When you bowl and complete, the league, you get a fantastic Go Bowling at the Glen Race Day Package! Top Team will receive the VIP Package! Bonus: Each person receives 3 FREE games of practice each week for the length of the league! Pizza, Soda & Beer Party the last day of the league! Every Thursday between 6:30-8:30pm for kids 17 & Under!! Unlimited Glow Bowling, Rental Shoes and 1 game of Laser Tag!! Upgrade your package for only $3 more and receive a $5 gift card!! All League bowlers receive a 10% discount on regular priced merchandise at Bowlers Supply!